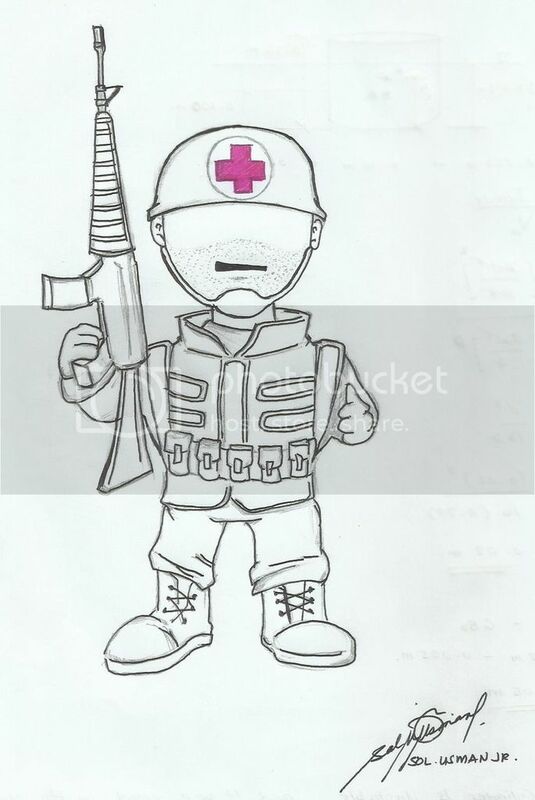 I think it will be a good idea if there is an addition of new characters..
speaking of physical features of a medic..
medic always carries a bag with him..
where he can put his medical kit..
and he is an expert in medicine..
Medic wears a helmet that has a marked red cross symbol in it..
when it comes to his skills..
the Medic Skills will just focus on supporting his comrade..
just like El Comandante's Epic Skill Compass..
but Comandante's Compass skill is NOT a Defensive Support Skill..
that can increase his offensive stat (Accuracy/Attack) as well as his Teammate..
lets say, a Skill that increases his Defense Stat (HP/Armor) as well as his Teammate..
the concept of this is that..
with the presence of a MEDIC..
and this will be also be fair enough for troop that has no regeneration skill..
in this way, the Gunners and Snipers..
will have the chance to be healed when wounded..
who always support his comrade..
who heals the wound of a wounded soldier..
a Medic must not only support his team..
but also he must protect and defend himself..
lets say he can borrow a skill from a Sniper's Desert Eagle..
and since they are focused on medical equipment..
i think Medic will be an expert with regards to stunning an enemy..
i would like also to suggest a new Character..
and his weapon is ofcourse a Flamethrower..
there exist also a flamethrower guy..
when it comes to his physical features..
FlameThrower wears a red suit..
that symbolizes fire... that is red..
or maybe huge same like hardrock's range.. and a vacuum grenade range..
you can make this MEDIC class troop as one of Legendary Characters..
Why? because MEDIC is a unique characters..
and aside from being Unique..
which is a SUPPORTING UNIT..
so to be fair enough..
these two cannot go with each other because it will be OverPowered..
there will be only 1 SUPPORTING UNIT that can go with the Squad..
maybe you can choose el comandante..
and then when you want to log out of the game..
and when it comes to flamethrower..
that is not belong to legendary characters..
Haha nice suggestion and also quantity selection if you buy any item like boxes that you could put amount to purchase. Honestly this game have a future to be top 1-3 on list. Cause of many things. Mostly on tactical gaming. Just add some more more features for much more excitement. because assuming that we want to buy 100+ star chest..
and this will takes us time..
whereas if the developers will add a features in which the player will just to input the number of pcs he want to buy..
then it will be very comfortable for us players to buy several or many chest..
and this will just takes us a few clicks.. lets say 1-3 clicks..